Time for the second installment of my Spoonflower posts (first post here). Ready for a project? And free pattern to go along? Great! I came up with something that only uses a fat quarter of fabric (since the organic knits are quite pricey). It’s cozy cute on baby. And the options are always endless. 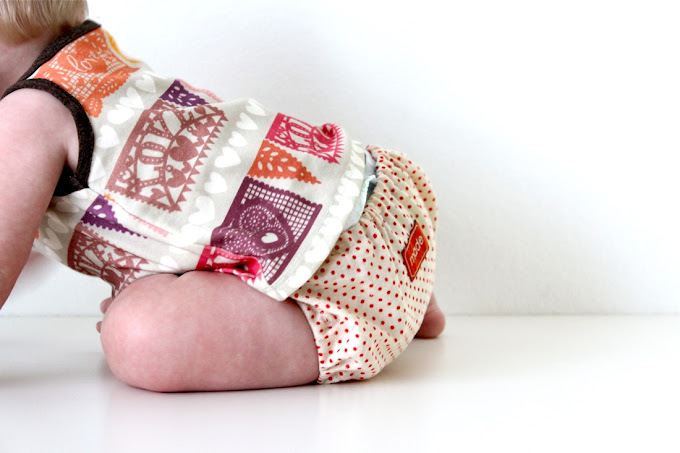 Get the details and downloadable pattern on the Spoonflower blog! And just a few more things to note…. • Some readers have mentioned that while the cotton woven fabrics on Spoonflower wash wonderfully, the knits tend to fade (especially with dark prints). I haven’t washed mine yet so I can’t weigh-in yet. But I have read this from a few users. Some say that it doesn’t bother them and that it only adds to the fabric’s character. And most users recommend hand-washing your items. • The full tutorial and pattern will be posted here on MADE later this week. • Don’t forget to enter the Fabrics A to Z book giveaway HERE (ends Tuesday night). love that chevron fabric! and the blue trim is perfect. so cute. Simple adorable. I love it all. Great work. oh she looks so grown up already! 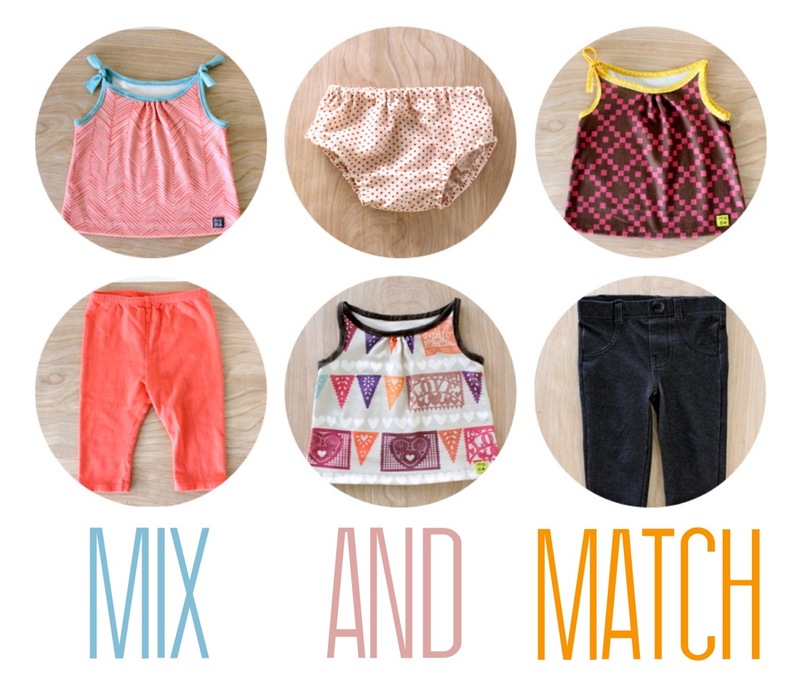 I love the idea of baby tanks (and a project that’s easy on the budget!) Thanks Dana! Oh those baby blues!!!!! Cute outfits too but the chubba wubba and baby blue eyes really get my vote. Just so darn kissable! Oh my…this is SO cute! The single bow one is my favorite. I love the fabrics you chose as well. That last photo of Clara is to-die-for cute! Can’t stand it! You can always make your fabric color fast before you wash it. There are plenty of tutorials out there about color fasting fabric. Just like vinegar sets dye on an Easter egg, fabric color can be set using 1 gallon of cold tap water, 1/2 cup white vinegar, and 1/2 cup salt. Mix with a wooden spoon and soak item for 1 hour. If color bleeds in the water, remove and do it again. The amount of color that bleeds will not affect the overall brightness of the colors on the fabric. For pricey fabrics with bright colors, this is a very good idea prior to garment construction. It’s better than warm wash water causing the color to bleed and heaven forbid set on other colors. This only needs to be done once and can also be done after a washing or two to preserve what color is left. That last picture is the cutest. Ever. Omg is she really that big allready? where is your baby ? This tutorial looks so simple! How do you make everything seem so simple and easy to do, Dana? You’re just awesome! I love your blog, and those are some super cute tees… I keep meaning to ask, how did you learn to draft patterns? I’d love to learn, but haven’t the foggiest where to start! Oh my gosh… these turned out adorable! 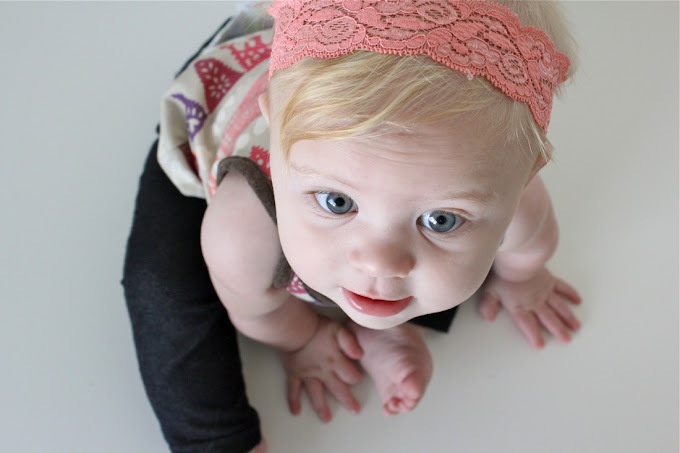 And your little model is growing SO fast! She is just the bees knees! I’m glad you’re blogging just so you take more pictures of your beautiful children! Well not JUST… your market skirts got me back into sewing for little ones ~ my granddaughters, and tomorrow we hopefully find out if the next one is a girl or boy. So these little outfits are a project I’m willing to take on! 😀 (Hand wash baby clothes?? I’m dying! lol… I’ll go for the “character of the fabric” instead!) Smiles Dana! It’s always a treat. Sewing with Spoonflower and my books for free!